The James River is a river in the U.S. state of Virginia. It is 348 miles (560 km) long, extending to 444 miles (715 km) if one includes the Jackson River, the longer of its two source tributaries. The James River drains a catchment comprising 10,432 square miles (27,020 km2). The watershed includes about 4% open water and an area with a population of 2.5 million people (2000). It is the 12th longest river in the United States that remains entirely within a single state. 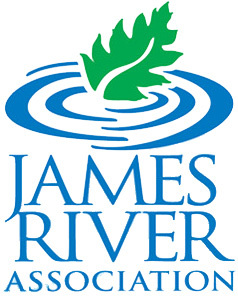 The James River contains numerous parks and other recreational attractions. Canoeing, fishing, kayaking, hiking, and swimming are some of the activities that people enjoy along the river during the summer. From the river's start in the Blue Ridge mountains to Richmond, numerous rapids and pools offer fishing and whitewater rafting. The most intense whitewater stretch is a 2-mile (3 km) segment that ends in downtown Richmond where the river goes over the fall line. This is the only place in the country where extensive class III (class IV with above average river levels) whitewater conditions exist within sight of skyscrapers. According to Scottsville's website, the town "served as Virginia's westernmost center of government and commerce during the 1700s, when rivers were the primary means of travel in the new American wilderness." During the late 18th and the 19th centuries attempts were made to improve navigability along the James, as well as other central Virginian rivers. Part of this was the construction of a canal running roughly parallel with the James west from Richmond.